NEW YORK, Sept. 20, 2017 /PRNewswire/ -- The L'Oréal USA For Women in Science program announced today the 10 winners of its Changing the Face of STEM (CTFS) mentoring grants. The projects awarded exemplify a broad range of activities and partnerships focused on mentoring and engaging girls and women in science, technology, engineering and math (STEM), from preschool to graduate school. The grants will help fund STEM programs throughout the country including in California, Connecticut, Florida, Maryland, Missouri, New York, Texas and Utah. 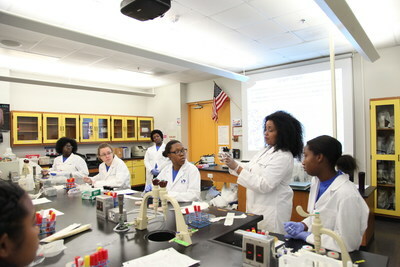 Dr. M. Nia Madison, Assistant Professor at Miami Dade College and 2010 L'Oreal USA For Women in Science Fellow, and high school students from the Miami Dade College Microbiology Girls Club participate in experiments. "Inspiring the next generation of women in STEM is a key component of the For Women in Science program," said Lauren Paige, Vice President of Public Affairs & Strategic Initiatives at L'Oréal USA. "We are proud to build on this commitment through our Changing the Face of STEM grant program and support our fellows in their efforts to promote STEM education in communities across the country." The L'Oréal-UNESCO For Women in Science program is a global philanthropy that recognizes and rewards women scientists around the world at critical stages in their career. Since the worldwide program began in 1998, more than 2,250 scientists in over 110 countries have been awarded for their work. In the U.S., the For Women in Science program rewards post-doctoral women scientists for their contributions in STEM fields and commitment to serving as role models for younger generations. Now in its 14th year in the U.S., the program has awarded 65 post-doctoral women scientists more than $3 million in grants. L'Oréal USA is the largest subsidiary of the L'Oréal Group, the world's leading beauty company. L'Oréal USA manages a portfolio of more than 30 iconic beauty brands, including Garnier, Giorgio Armani Beauty, Kérastase, Lancôme, La Roche-Posay, L'Oréal Paris and Yves Saint Laurent Beauté. L'Oréal USA also serves as the international hub for the product development and marketing strategy for L'Oréal's American brands: Baxter of California, Carol's Daughter, Clarisonic, Dermablend, Essie, IT Cosmetics, Kiehl's, Matrix, Maybelline New York, Mizani, NYX Professional Makeup, Pureology, Ralph Lauren Fragrances, Redken, Softsheen-Carson, SkinCeuticals and Urban Decay. Generating more than $6 billion in sales annually, L'Oréal USA is committed to growth through sustainable innovation, driven by the company's Sharing Beauty With All ambition for sustainable development across the Group's value chain. The company is headquartered in New York City, employs more than 11,000 people, and operates administrative, research, manufacturing and distribution facilities across 14 states, including Arkansas, California, Florida, Kentucky, New Jersey, Ohio, Texas and Washington. For more information, visit www.lorealusa.com or follow us on Twitter, Facebook and Instagram @LOrealUSA.